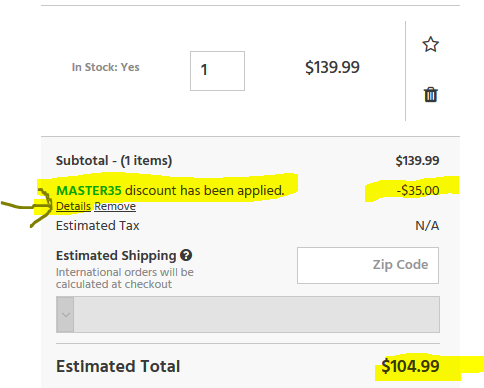 If you are willing to use MasterPass as your payment method (Masterpass is Mastercard’s version of VISA Checkout), coupon code MASTER35 gets you $35 off an order of $100 or more at the Monoprice website. The offer ends Tuesday night (1/24/17) or earlier (the “while supplies last” thing – whatever that means). Strategically, if you keep your order total around $100 (before taxes, before shipping), you would be getting an effective 35% discount, which is pretty pretty pretty good. A good opportunity to load up on various accessories and cables and consumables. Monoprice also offers products from other manufacturers these days, but they don’t carry everything. If you click on the little “Details” link in the shopping cart next to the coupon, you will get a popup with a list of all the excluded products. NOTE: you don’t have to pay with an actual Mastercard credit card. MasterPass is a payment service, you can use VISA, Mastercard, AMEX, Discover or Diners.